A Married Man's Response to a Vulgar Yet Tempting Offer of a Gorgeous Lady is Heroic! Social media sites are great platforms where people can connect and communicate even miles apart. However, these useful innovations are likewise misused most of the time. There are people who deliberately use these supposedly useful applications to execute their dark intentions towards others. Let's just be grateful because there are a few who stand for what is right and proper. A viral Facebook post caused commotion on the internet. 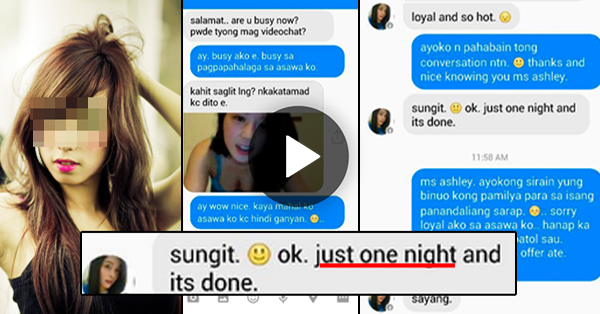 A Facebook user named, Jackie Moran Delos Santos, posted a screen shot of a conversation between a girl named 'Ashley' and an unknown married man. At first, the lady wanted to mingle with the guy in a video chat, but the guy refused. The woman insisted to pursue the conversation and even sent her alluring photo, the married dude replied how he loves his wife instead. And at the end of the message thread, the man graciously declined the enticing offer of the itching woman, emphasizing his loyalty to his marriage, to his wife and to his family.